Urban and peri-urban forests are green infrastructures (GI) that play a substantial role in delivering ecosystem services such as the amelioration of air quality by the removal of air pollutants, among which is ozone (O3), which is the most harmful pollutant in Mediterranean metropolitan areas. Models may provide a reliable estimate of gas exchanges between vegetation and atmosphere and are thus a powerful tool to quantify and compare O3 removal in different contexts. The present study modeled the O3 stomatal uptake at canopy level of an urban and a peri-urban forest in the Metropolitan City of Rome in two different years. Results show different rates of O3 fluxes between the two forests, due to different exposure to the pollutant, management practice effects on forest structure and functionality, and environmental conditions, namely, different stressors affecting the gas exchange rates of the two GIs. The periodic components of the time series calculated by means of the spectral analysis show that seasonal variation of modeled canopy transpiration is driven by precipitation in peri-urban forests, whereas in the urban forest seasonal variations are driven by vapor pressure deficit of ambient air. 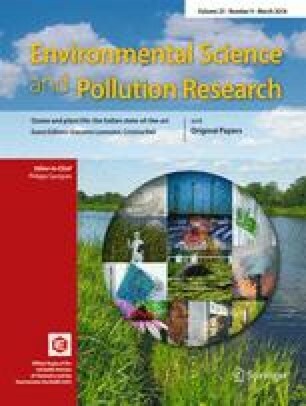 Moreover, in the urban forest high water availability during summer months, owing to irrigation practice, leads to an increase in O3 uptake, thus suggesting that irrigation may enhance air phytoremediation in urban areas. The online version of this article ( https://doi.org/10.1007/s11356-017-0474-4) contains supplementary material, which is available to authorized users. We thank the national projects financed by Regione Lazio-Lazio Innova URBANFOR3. The research was also made possible thanks to the Scientific Commission of Castelporziano and the Multi-disciplinary Center for the Study of Coastal Mediterranean Ecosystems. We thank the Servizio Integrato Agrometeorologico della Regione Lazio for climatic data provisioning. This research has been supported by the following grants: MIUR, Rome, Project PRIN 2010–2011 “TreeCity” (Prot. no. 20109E8F95); Sapienza Research Project “Avvio alla Ricerca” 2015 (Prot. no. C26N15CHHN); and Sapienza Ateneo Research Project 2015 (Prot. no. C26A15PWLH).